Tell your children the traditional story of ‘Jack and the Beanstalk’. Provide a large story sack full of props related to the story. Retell the story and allocate props to individual children. Encourage them to use the props at the relevant moments to help you tell the story. Leave the story sack in your story corner, alongside other versions of the story and some story tapes. 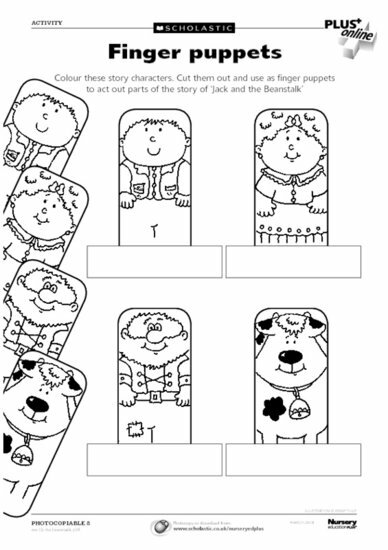 Provide finger puppets linked to the story in the story corner, or make your own from the ‘Finger puppets’ activity sheet. Let the children play freely with the resources and encourage them to act out their favourite parts of the story.